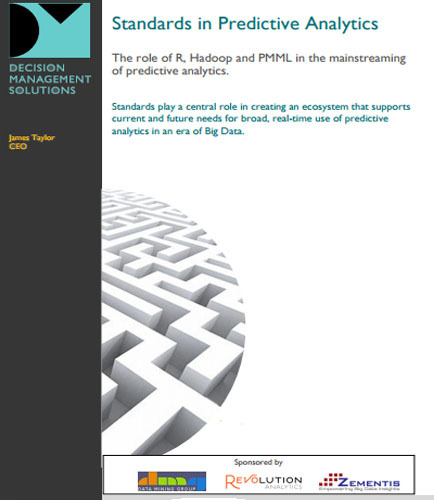 "The role of R, Hadoop and PMML in the mainstreaming of predictive analytics"
Predictive analytic Standards are playing a central role in creating ecosystem that supports current and future needs for broad, real time use of predictive analytics in the era of big data. Predictive analytic standards help organizations institutionalize predictive analytics by simplifying user experience in turn enhancing adoption, encouraging utilization and establishing a culture of insight driven decision making at all levels. Predictive analytics is becoming the mainstream of most companies, most organizations making it as a part of their overall organization. Predictive Analytics is a branch of advanced analytics that employs a variety of statistical techniques such as data mining and modeling, machine learning, statistics, and artificial intelligence. These techniques analyze the historical and current data in order to make forecasts about future or unknown events. Predictive models are used in the business field to identify opportunities and risks by observing patterns found in the transactional and historical data.